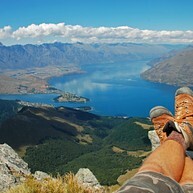 Queenstown, the self-proclaimed world´s capital of adventures, has, without a doubt, earned its title. The birthplace of bungee jumping, and home to all manners of adrenaline pumping activities, from luge and jet-boating to canyon swinging, attracts every year thousands of adventure lovers. Set on the edge of the giant Lake Wakatipu, in the Otago region, this intimate town transforms itself into a buzzing ski resort during winter, thanks to its two appealing ski-fields that suit sport lovers of any abilities. 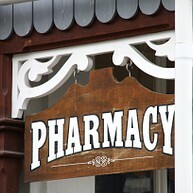 Opening hours: Typical hours for shops are Monday-Friday 9 am-8 pm, with an earlier closing on weekends. The "Adventure Capital of the World" doesn’t fail to entertain the traveler, offering heart pounding activities from bungee jumping and luge rides to white water rafting and jet boating. The specific conformation of the territory allows the numerous holidaymakers to enjoy water-sports and lake cruises as well as suggestive excursions surrounded by unspoiled nature. The Shotover and Kawarau rivers are top spots for white-water rafting, offering a bunch of challenging rapids and a backdrop of wild nature. 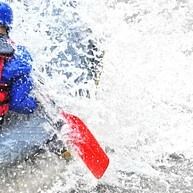 Queenstown Rafting operates two daily expeditions on both rivers. 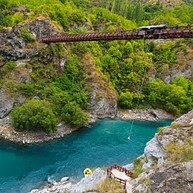 AJ Hackett operates four bungee jumping spots in Queenstown, ranging from the world´s home-place of bungee jumping, Kawarau Bridge Bungy, 43m (141ft.) high, to the Nevis Highwire Bungy, which, at 143m (440ft. ), is one of the highest in the world. Experience the thrills and spills of Jet Boating by speeding down the Shotover River, just a a few inches away from the rocky canyon walls. 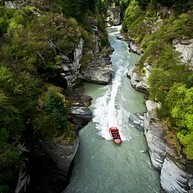 Shotover Jet has been providing adrenaline-boosting adventures since the 70’s, for more than three million brave souls. 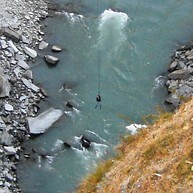 Step off the edge of a cliff 109m / 360ft above the Shotover River on the world’s highest swing: the Shotover Canyon Swing. As they developed 10 different jump styles, there’s a level of thrill to suit everyone. Test out your driving skills around the hairpin bends of the Skyline Luge as you hurtle on a gravity fueled vehicle. It operates from 9 am to dusk, and tickets are available from the Skyline Gondola terminals. Truly thrilling and with a stunning view across Queenstown, Lake Wakatipu and the Remarkables, this will be a ride you will not forget. Take it easy and try something a little more leisurely by discovering Queenstown on one of the many boats that cross lazily Lake Wakatipu. Queenstown Fishing Charters offers a variety of cruise options, from fishing cruises to elegant functions. Located in the heart of the hectic Queenstown, this wildlife sanctuary is an oasis of calm. Star attractions include the iconic kiwi bird and the tuatara, a unique 200-million-year-old reptile species which has a ‘third eye’ on the top of its head. 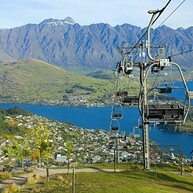 Skyline Queenstown is an adventure for the whole family that is located only five minutes from the city centre. It is reached by Gondola cable-way that ends with a sweeping view of the city-centre and Lake Wakatipu, a restaurant, a playground for kids and the opportunity to bungee jump. Located on a small peninsula on the shoreline of Lake Wakatipu´s, Queenstown gardens is a focal point for visitors who appreciate the opportunity to relax in a well-kept garden with magnificent lake and mountain views. 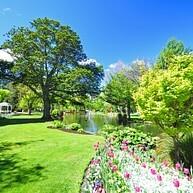 The garden is a perfect picnic spot and is easily to reach due to the proximity to the city centre. You do not have to be a professional golfer to go to Jacks Point and enjoy the surroundings or the impeccable service at the clubhouse. It is an 18 holes par 72 championship course that offers its golfers both a challenge and an unforgettable experience. Despite being located close to Queenstown, Moke Lake offers its visitors a respite from the city noise and endless outdoor options. You can follow the track around it, go for horseback riding, fishing, kayaking or cycling. 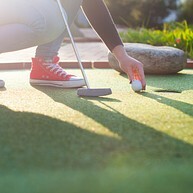 Queenstown Mini-Golf offers entertainment for kids and families, providing a course equipped with 18 themed holes that can be booked for parties. Take a break from extreme sport activities and pop in for a round. 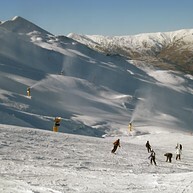 Coronet Peak is the most popular skiing area in South New Zealand, and it is located only a 20 minutes drive away from the city. The view up the mountain makes you feel on top of the world, and the dramatic slopes are provided with tracks for snow lovers of any ability. This is not just another ordinary ice-skating experience. This ice arena, situated in Queenstown Gardens, is equipped with a LED lights system, ice sleds, and hockey gears for the more competitive ones, offering activities for all ages. If you feel the urge of escaping the city for a day trip, you can venture to Arrowtown, a former gold-rush town located 25 minutes from Queenstown. Nowadays, this picturesque town is home to a number of delightful heritage buildings as well as inviting cafés, restaurants, boutiques and galleries.